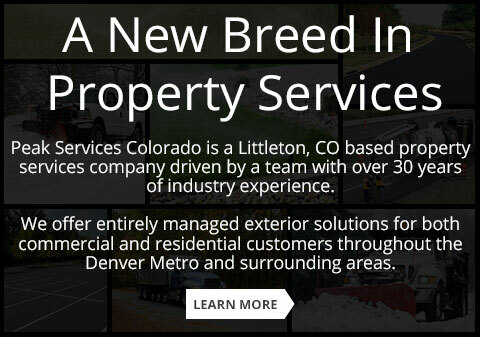 ​Peak Services Colorado is a Littleton, CO based property maintenance company driven by a team with over 30 years of industry experience. We offer entirely managed exterior solutions for both commercial and residential customers throughout the Denver Metro and surrounding areas. ​Your account manager is here to insure your needs are always treated as a priority. We have earned a reputation for delivering only the finest work on­-time and on­ budget. ​We have the experience, knowledge and a vested interest in making sure your satisfied. Are you looking to step up your property’s curb appeal or just need your home maintained and manicured? Peak Services is here to help with our seasonal or year­-round landscape and irrigation management services. ​We have the experience and equipment available to support both industrial and commercial properties. Whether you are in need of a single project to be completed or on­going maintenance services, you can depend on Peak to deliver a solution catered to your needs. ​We take a dedicated approach when providing our commercial snow and ice management services for our clients. Our rapid response fleet is available 24/7 to insure your property’s ice and snow liabilities are well mitigated. ​Are you performing a new construction or renovation project on an existing property? We combine the correct equipment and technology necessary to handle even the most sophisticated of jobs. Our crews have over 20 years experience working on commercial and industrial projects. ​I have never received such wonderful customer service starting with Scott and his team. Everyone has been very professional since day one. Their work is very neat and the job is always completed. They are consistent with communication and the quality of their work is outstanding.